حسن‌زاده, سالار, خان‌فرخانی, امید, قربانی واقعی, بهمن, صندیدزاده, محمدعلی. (1397). تنظیم برخط ضرایب کنترل‌کننده PID به روش جدول‌بندی بهره فازی برای سیستم پانتوگراف قطارهای برقی پرسرعت. پژوهشنامه حمل و نقل, 15(4), 363-373. سالار حسن‌زاده; امید خان‌فرخانی; بهمن قربانی واقعی; محمدعلی صندیدزاده. "تنظیم برخط ضرایب کنترل‌کننده PID به روش جدول‌بندی بهره فازی برای سیستم پانتوگراف قطارهای برقی پرسرعت". پژوهشنامه حمل و نقل, 15, 4, 1397, 363-373. 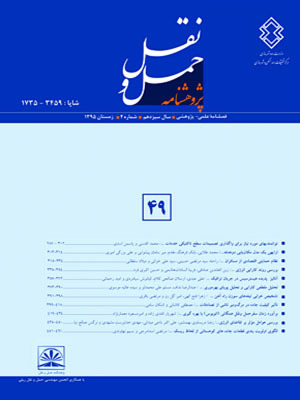 حسن‌زاده, سالار, خان‌فرخانی, امید, قربانی واقعی, بهمن, صندیدزاده, محمدعلی. (1397). 'تنظیم برخط ضرایب کنترل‌کننده PID به روش جدول‌بندی بهره فازی برای سیستم پانتوگراف قطارهای برقی پرسرعت', پژوهشنامه حمل و نقل, 15(4), pp. 363-373. حسن‌زاده, سالار, خان‌فرخانی, امید, قربانی واقعی, بهمن, صندیدزاده, محمدعلی. تنظیم برخط ضرایب کنترل‌کننده PID به روش جدول‌بندی بهره فازی برای سیستم پانتوگراف قطارهای برقی پرسرعت. پژوهشنامه حمل و نقل, 1397; 15(4): 363-373. پانتوگراف یکی از مهم‌ترین اجزای انتقال برق به قطار می‌باشد که توسط آن می‌توان برق را از شبکه بالاسری به قطار منتقل نمود. ارتباط دائم پانتوگراف با شبکه برق تحت هر شرایطی لازم است. از طرفی، پارامترهای شبکه بالاسری دارای عدم قطعیت بوده و در طول یک دهانه متغیر هستند. این مساله کنترل پانتوگراف را بخصوص در سرعت‌های بالا با چالش روبرو می‌سازد. در این مقاله هدف نگه‌داشتن نیروی تماسی بین پانتوگراف و سیم‌های برق در یک سطح مطلوب با درنظر گرفتن عدم قطعیت برای شبکه بالاسری است. برای دستیابی به این هدف ابتدا معادلات دینامیکی یک سیستم پانتوگراف با دو درجه آزادی استخراج شده و یک کنترل کننده PIDبرای سیستم طراحی گردیده است. در گام بعد به منظور بهبود پاسخ کنترلر در حضور عدم قطعیت در شبکه بالاسری، ضرایب کنترل کننده PIDرا از روش جدول بندی بهره تنظیم کرده و سپس برای کاهش نوسانات، این پارامترها از روش جدول بندی بهره فازی به صورت برخط به روز می‌شوند. در نهایت عملکرد سه کنترل کننده بر روی سیستم پانتوگراف با ملاحظات عملی شبیه‌سازی و تحلیل شده است. نتایج نشان می‌دهند که ترکیب منطق فازی با روش جدول بندی بهره‌، منجر به عملکرد بهتر کنترلر PID می‌شود. Pantograph is one of the most important equipment of Electric trains which transferred power from the Catenary to train. Permanent connection of pantograph to the catenary is necessary under all circumstances. On the other hand, the catenary parameters have uncertainly and are variable in a span. This feature challenged the pantograph control issue especially in high speed trains. Maintaining the contact force between pantograph and catenary system under these uncertainties is the aim of this article. So, the dynamic equation of a 2 Degrees of Freedom (2-DOF) pantograph-catenary system is derived and a PID controller is designed, firstly. The Overshoot, Undershoot and oscillations are high in contact force under PID controller, because there are uncertainties in catenary parameters. For reducing the uncertainties effects, the PID parameters are tuned by gain scheduling method. For achieve to better responses, the fuzzy logic is combined to gain scheduling method and the PID parameters updated online using this fuzzy gain scheduling method. Finally, the performance of three controllers on pantograph-catenary system is simulated and analyzed under practical situations. The results show that the combination of fuzzy logic with gain scheduling method lead to improved performance of PID controller for pantograph-catenary system. Åström, K. J., &Hägglund, T. (1995), “Advanced PID control”, 2nd Edition, USA: Instrument Society of America. -Aydin, I., Karakose, E., Karakose, M., Gencoglu, M. T., & Akin, E. (2013), “A new computer vision approach for active pantograph control”,IEEE International Symposium on Innovations in Intelligent Systems and Applications (INISTA),Albena, June 19-21, IEEE, pp.­1-5­. -Bucca, G., &Collina, A. (2009),“A procedure for the wear prediction of collector strip and contact wire in pantograph–catenary system”,An International Journal on the Science and Technology of Friction, Wear, No. 266(1), pp. 46-59. -Bucca, G., Collina, A., Manigrasso, R., Mapelli, F., &Tarsitano, D. (2011),“Analysis of electrical interferences related to the current collection quality in pantograph–catenary interaction”, Part F: Journal of Rail and Rapid Transit, No. 225(5), pp. 483-500. -Garg, R., Mahajan, P., & Kumar, P. (2013),“Effect of controller parameters on pantograph-catenary system”, American International Journal of Research in Science, Technology, Engineering & Mathematics, pp. 233-239. -Huang, Y. J. (2004),“Discrete fuzzy variable structure control for pantograph position control”,Journal of Electrical Engineering, No. 86(3), pp. 171-177. -Ide, C. K., Olaru, S., Rodriguez-Ayerbe, P., &Rachid, A. (2013),“A nonlinear state feedback control approach for a Pantograph-Catenary system”, 17th International Conference In System Theory, Control and Computing (ICSTCC),Sinaia,October 11-13, 2013, IEEE, pp. 268-273. -Lin, Y. C., Lin, C. L., & Yang, C. C. (2007),“Robust active vibration control for rail vehicle pantograph. Vehicular Technology”, Journal of IEEE Transactions on Vehicular Technology, No. 56(4), pp. 1994-2004. -Lin, Y. C., Shieh, N. C., & Liu, V. T. (2015),“Optimal control for rail vehicle pantograph systems with actuator delays”,Journal of IET Control Theory & Applications, No. 9(13), pp. 1917-1926. -McCormack, A. S., & Godfrey, K. R. (1998),“Rule-based autotuning based on frequency domain identification”,IEEE Transactions on Control Systems Technology, No. 6(1), pp. 43-61. -Mokrani, N., &Rachid, A. (2013),“A robust control of contact force of pantograph-catenary for the high-speed train”, Control Conference (ECC) European,Zurich,July 17-19, 2013, IEEE, pp. 4568-4573. -O’connor, D. N., Eppinger, S. D., Seering, W. P., &Wormley, D. N. (1997), “Active control of a high-speed pantograph”, Journal of Dynamic Systems, Measurement, and Control, No. 119(1), pp. 1-4. -Rachid, A. (2011),“Pantograph catenary control and observation using the lmi approach”, 50th IEEE Conference on Decision and Control and European Control (CDC-ECC),Orlando FL, December 12-15, IEEE, pp. 2287-2292. -Shudong, W., Jingbo, G., &Guosheng, G. (2008), “Research of the active control for high-speed train pantograph”, IEEE Conference on Cybernetics and Intelligent Systems, Chengdu, September 21-24, IEEE, pp. 749-753. -Teixeira, T. M. O. V. (2007), “Dynamics and Control of a High Speed Train Pantograph System”, Instituto Superior Technico, UniversidadeTechnica de Lisboa. -Wang, L. X. (1999), “A course in fuzzy systems”, International Edition, USA: Prentice-Hall press. -Wang, M., &Crusca, F. (2002),“Design and implementation of a gain scheduling controller for a water level control system”, ISA transactions, No. 41(3), pp. 323-331. -yokoyama, m., yokoyama, s., sakakibara, h., kobayashi, s., usuda, t., &ikeda, m. (2015), “Modeling and robust control of a high speed train pantograph”, Mechanical Engineering Journal, No. 3, Vol. 2. -Zhao, Z. Y., Tomizuka, M., &Isaka, S. (1992),“Fuzzy gain scheduling of PID controllers”,First IEEE Conference on Control Applications,Dayton OH,September 13-16, IEEE, pp. 698-703.